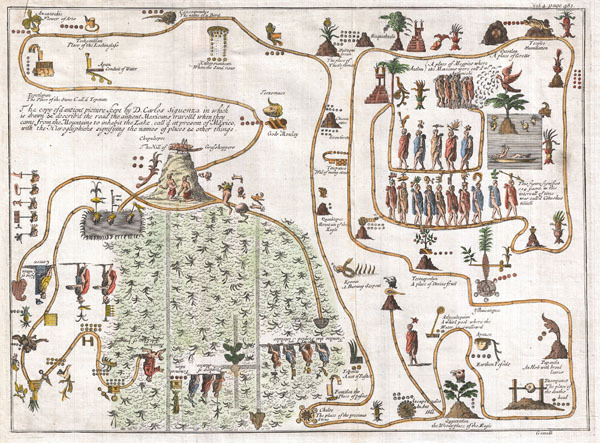 The copy of a antient picture kept by D. Carlos Siguenza in which is drawn & describ'd the road the antient Mexicans travell'd when they came fromteh Mountains to inhabe the Lake, call'd at present of Mexico, with the Hieroglyphicks signifying the names of places & other things. Gemelli Careri, G. F., A Voyage Round The World. In Six Parts, viz. I. of Turky. II. of Persia. III. Of India. IV. Of China. V. of the Philippine Islands. VI. Of New Spain Written Originally in Italian, Translated into English. , (Printed for Awnsham and John Churchill at the Black Swan in Pater-noster-Row, London) 1704. Very good. Original folds. Beautiful hand color. Backed with linen.